First Line: After a long day of contract negotiations, phone calls to authors and editors, and a meeting with my fellow literary agents, the last thing I expected was to come home to find my kitchen on fire. The Taste of the Town festival is almost ready to hit Inspiration Valley, North Carolina. The Novel Idea Literary Agency is organizing a celebrity chef event, and one of its agents, Lila Wilkins, is right in the thick of things. Unfortunately things get off to a very rocky start. After the welcome dinner given for all the chefs, an oven in the demo kitchen explodes, killing one of the star cooks. Now Lila has to figure out which one of her clients is a killer. I continue to enjoy this Novel Idea cozy series created by the writing team known as Lucy Arlington. In Inspiration Valley, they have created a town in which all lovers of books, food, and the arts would love to live. It's such a perfect place, in fact, that the setting gives the series a bit of a fairy tale aspect, and it's one in which I love to escape whenever a new book appears. The cast of characters is varied and well-drawn, and adding a group of television chefs with their quirks and egos increases the enjoyment factor. Lila Wilkins is at the book's heart, and her life is not a static one. We get to watch her son grow from boy to man, we see her relationship with her mother change, and her growing attachment to police officer Sean Griffiths touches on all aspects of her life. I particularly like the relationship between Lila and Sean; it isn't the usual one where the law enforcement man in the heroine's life frowns upon her doing her own investigating. Sean sees Lila for who she is, and he's willing to work with her instead of against her. It makes a refreshing change. One of the best things about this series is that readers have the feeling that they are getting behind-the-scenes looks at what it's like to work at a literary agency. Not only do they get that here, but there's the added bonus of insider views of the television culinary scene. What are those celebrity chefs really like when the cameras aren't rolling? How do they interact with each other? Why do they do what they do? 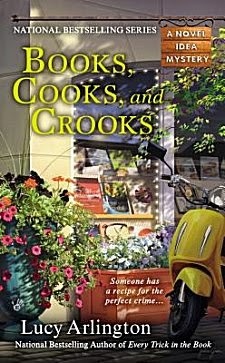 There's only one thing that kept me from thoroughly enjoying Books, Cooks, and Crooks: very early on when Lila is giving the chefs and their entourages a guided tour of where they'll be working, clues to what is going to happen-- and who's going to do it-- are practically gift wrapped and presented to readers. However, with a series that has so much richness and depth in both characters and situations, this was only a minor annoyance. Bring on Book Four! Cathy - This sounds like a fun read, even if it wasn't exactly perfect. I always do love it when a series has characters with some depth and richness, and it sounds as though this one does.